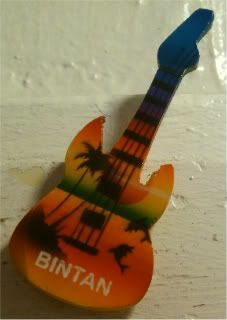 My friend brought this magnet back for me from Bintan, Indonesia. And yes, I had to look up where it was. It's an island getaway, and we all know how I feel about islands. Anyway, picked it for Duran Duran Appreciation Day because of my John Taylor, bassist for my fave band of all, all, all time. And also, its tropical island motif reminds me of the Save a Prayer video shot in Sri Lanka from 1982. What? Of course, I could have used Rio, but don't get me started on how when people say they love Duran Duran, they're like, "yeah, I loved Rio." That makes me crazy. Not that I'm much better with showing you Save a Prayer, but I haven't seen this video in ages. So, yeah, enjoy. Although, if I'm hard-pressed, my favorite Duran Duran track might actually be New Religion, because it's so much fun to sing. How can a chick be bigger than a chicken? "It's our time down here!"